When choosing between all the Destin condo rentals available today, you might want to narrow down your search to just a few key buildings in the area. One of those top buildings may just be Jade East Towers, which has a convenient location near top attractions. When you open your door and step outside, you’ll also love knowing just how close you are to the beach. The beach is literally steps right outside the front door. Take advantage of the views the resort offers of the water with your own private balcony. Renting a hotel room might be a smart choice for someone traveling solo or with just one other person. When you travel with kids, you need more space and separate spaces for each member of your family. Jade East offers a wide range of room types and sizes. You’ll find rooms suitable for even the largest of families and rooms that are perfect for getaways with close friends. Many of the available units have two or three separate bedrooms and can accommodate between six and eight people. In addition to private bedrooms, you’ll also have a fold out couch too. 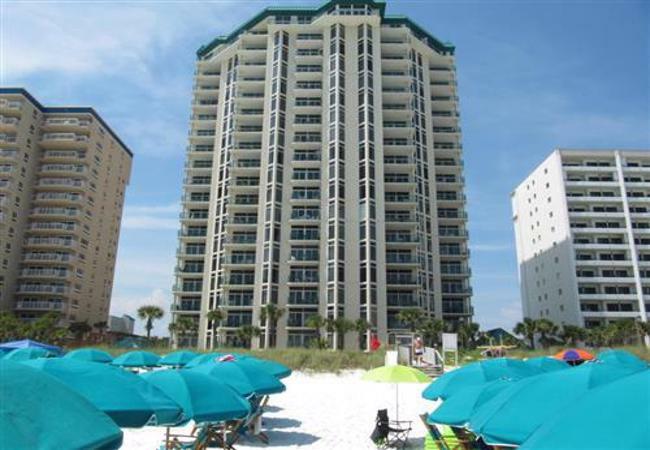 This resort is popular with those who want to enjoy the gorgeous views of the water and the amazing views of Destin. Large windows in many rooms let you see those views from the moment you first wake in the morning. Those windows and your own balcony overlook the gulf and let you smell the fresh sea air. Modern furnishings in each room will make you feel completely at home. If you’re in the mood for cooking, you can head right into your private kitchen to whip up a meal for your gang. Some travelers worry that they’ll put on a few pounds while on vacation, but these Destin condo rentals make it easy for you to stay in shape. Head down to the state of the art fitness center to start your day off with a little cardio. The fitness center boasts great machines and equipment, including stair climbers, rowing machines and even elliptical machines. You can then let your muscles relax with a long soak in the hot tub before joining new or old friends for a game on the basketball court. This Destin resort also has tennis courts with lights that come on once the sun goes down.